Milwaukee Tool has been really targeting and capturing the speciality tool market with their cordless line over the last few years. 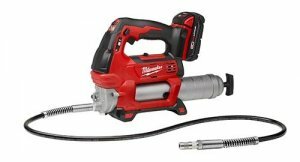 While most of their speciality tools fall under their M12 line, the newly announced Milwaukee cordless grease gun will indeed be powered by 18-volts. It wasn't too long ago that Milwaukee came out with a 12-volt cordless grease gun, but there's nothing wrong with them making a more powerful 18-volt version. Features of the new Milwaukee 2646-21 grease gun include a two-speed high/low flow rate, onboard LED light, lock-on/off trigger, and a plunger rod with grease capacity markings. Included is a shoulder strap for easy mobility and use over head, and a 48-inch hose for those hard to reach places. Many industries, including agriculture and manufacturing, rely on heavy machinery with hundreds of grease fittings that must be maintained daily to ensure efficiency," says Mike Monteleone, Associate Product Manager for Milwaukee Electric Tool Corporation. "Delivering unmatched power, speed and productivity, the M18™ 2-Speed Grease Gun empowers machinery operators to handle anything from routine maintenance to challenging greasing applications in the field, rather than bringing heavy machinery into the shop for maintenance. Includes 2646-20 grease gun, 48" Flex Hose w/ Spring Guard, High Pressure Grease Coupler, Shoulder Strap, (1) M18™ Compact RED LITHIUM™ Battery, 30 minute charger, and carrying case.